* Induce creativity: Your bundle of joy needs to be gently nudged into a world of imagination and wonder. Grab his or her interest in all things creative and stimulating by infusing an element of magic, fantasy and popular kids’ literature into their rooms. Think of bedsheets and pillows with cartoon characters, wall motifs that make them want to read fairytales and wall decals with famous animated movie figures. 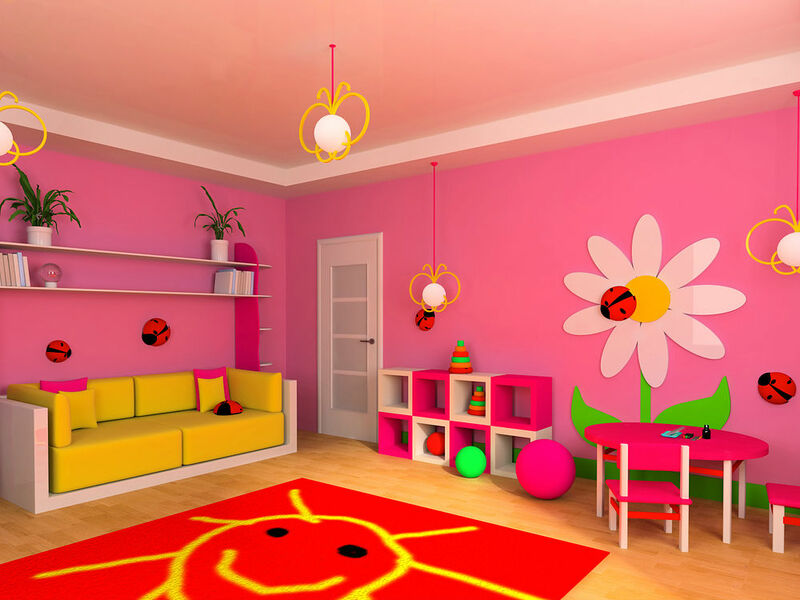 * Splash colours: Most parents understand that a child’s room must exude bright happiness in terms of the colour scheme. Yet many desist from undertaking the project of altering the way the room looks. This is because the traditional belief is that to spruce up the room, one has to invest in recolouring the walls. However, this isn’t true. In fact, most contemporary designers believe that it’s better to have the walls painted in a sober shade and splash vibrancy in other ways through upholstery, accessories, exuberant rugs, beanbags and lots of visually pleasing books. * Go natural: Children love the outdoors and nature, and if you don’t want them to end up as couch potatoes once they grow up a little, it will be best to encourage this feeling of oneness with all things natural. Boost their love for the wild by cleverly infusing quirky elements into their abode. Wallpapers that represent forests or mountains and ceilings with stars that shine in the dark usually work well. Wooden furniture and flooring best complement such a theme. * Create space: When designing an interior scheme for your baby’s room, it’s essential to keep in mind that he or she needs a lot of space. If you have one room for two children, a bunk bed is a great idea. Not only do children find it cool and fun, it also makes way for an activity area. Just spread a funky carpet, scatter a few toys here and there and the perfect playroom is ready. Your little princess can also lay her Barbie set here and delve into her beautiful world of fantasy.